Semarang, Central Java - Today, (Friday / March 9, 2018) PT Toyota Motor Manufacturing Indonesia (TMMIN) through CSR activities of education and human resources development which is "Toyota Sharing Knowledge" program that give a real contribution of Donation Educational Props and Knowledge Transfer through Public Lecture located in Industrial Engineering Building, Faculty of Engineering, Department of Industrial Engineering, Diponegoro University (UNDIP), Semarang City, Central Java. This donation activity consists of the handover of laboratory equipment of 1 package of Lean Manufacturing Laboratory, 1 package of Lean Production System Laboratory, and 1 Unit of Innovation Machine Kijang Innova to Industrial Engineering UNDIP students. These three donations are aimed to simulate real-world situations for students so they can become a bridge in the creating a ready-to-use global human resources. Besides donation of educational props, on the same occasion, Warih Andang Tj. as President Director of PT TMMIN also delivered a public lecture about Toyota Indonesia journey in the industry for UNDIP students. The donation and public lecture was attended by the Rector of UNDIP Prof. Dr. Yos Johan Utama, SH., M. Hum., President Director of PT TMMIN Warih Andang Tj, Director of Administration, Corporate & External Affairs PT TMMIN Bob Azam, Director of Manufacturing Unit Toermoedi and academic staff of UNDIP and PT TMMIN Management. The main reason to make UNDIP as one of the role model of college for "Toyota Sharing Knowledge" program is because this university becomes one of the 10 best universities based on The Minitries of Research, Technology, and Higher Education RI assessment in 2017. 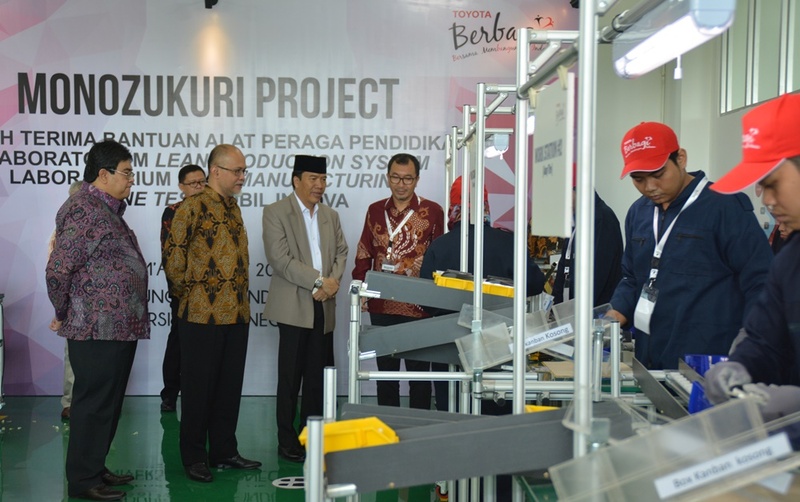 Besides UNDIP, Toyota previously donated 1 package of Laboratory Lean Production System to the University of Indonesia (UI) in 2015. As it planned, other than UNDIP and UI, Institute Technology Sepuluh Nopember (ITS) will also be visited also by Toyota Sharing Knowledge program thatfocuses on education curriculum in Indonesia. These three universities are expected to respond to the challenge of the need for link & match between industry and education. Laboratory are very essential to achieve a highly competitive manufacturing industry. The course material that applied in the Department of Industrial Engineering UNDIP takes the basic concept of Toyota Production System (TPS) in Toyota Indonesia. Lean Manucaturing (LML) is the depiction of TPS simulations in car production from Line Assy to become a product received by consumers. Meanwhile, Lean Production System (LPSL) is the design and implementation of production systems that ensure the efficiency of all the factors involved, start from the use of raw materials, production processes to human resources (HR). LMSL and LPSL have the function to link the manufacturing process in laboratory scale so that students can do learning and change especially in manufacturing and understanding the whole concept of TPS. The existence of LMSL and LPSL supports students to design a production system that can achieve optimal production in terms of volume and timeliness with the most efficient cost along with the dynamics or development of the company needs. In its development, other than education curriculum that conceptualized through the Directorate of Higher Education (Dikti) of the Ministry of National Education, Toyota Indonesia also transferred the concept to the procurement of equipment to the pilot model university. Indonesia's future industry challenges in regional and global competitions will be tighter, especially for manufacturing industries that are driven to continue improving productivity in the form of human resources quality, development of management systems, and high tech innovation. Toyota Indonesia wishes to support in the sector of higher education practicum, so that university graduates in besides having good theoretical knowledge also possess industry-leading practice skills that pave the way for adaptation in the real work. "The various activities within the 'Toyota Sharing Knowledge' section of the university lecture curriculum are expected to be a great first step towards fostering generations of change that competitive. In the future, Indonesian universities can be the center of technology development for the development of manufacturing industry sector in Indonesia, "said Bob Azam, Director of Administration, Corporate & External Affairs of PT TMMIN. For almost 5 decades, Toyota is striving to give full participation and support to the development of Indonesian industry. One of them is through the development of human resources to meet the needs among qualified graduates with the high demand of the industrial world. The overall commitment is summarized in the spirit of Toyota Berbagi (Together Building Indonesia) which consists of three pillars which are product and technology development, automotive industry development and corporate social responsibility.